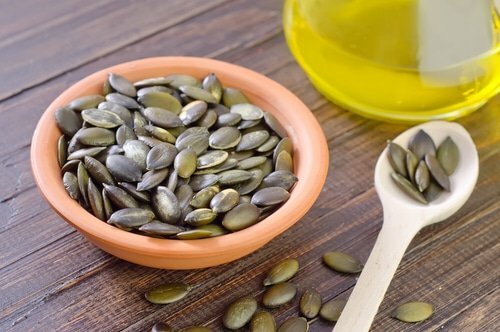 You may already enjoy tasty pumpkin seeds as a nutritious snack, but did you know they also can do wonderful things for your skin? Packed with essential fatty acids, vitamins, minerals, antioxidants, and more, the oil from pumpkin seeds helps soothe, hydrate, protect, and renew your look—making it a great ingredient for anti-aging formulas. This one ingredient gives you protection, deep moisturization, and much more! Pumpkin is a gourd-like squash scientifically named Cucurbita that’s native to North America. Considered a fruit of the pumpkin plant, it ranges in size from about 9 pounds to up to 75 pounds, and is usually orange or yellow, though varying species also product dark green, white, red, and gray fruits. Pumpkin likes warm weather and is usually planted in early July in rich soils that hold water well. It produces both a male and female flower, though honeybees are important for fertilization. Vines are delicate, and can be easily damaged. Harvesting occurs from September through October, which is why you typically see so many pumpkins around Halloween time. Pumpkin seeds have a number of health benefits. They’re naturally rich in phytosterols that have been shown in studies to help reduce LDL “bad” cholesterol. They’re a good source of tryptophan, an amino acid that’s important in producing feel good hormones called “serotonin.” Tossing back a handful of pumpkin seeds in the afternoon may help uplift your mood, or may help you sleep if you’re having trouble getting enough shut-eye. The benefits don’t stop there. These seeds are rich in fiber, which can help benefit digestive health, and also provide a good source of muscle-building protein. Minerals include iron, zinc, phosphorus, potassium, selenium, and magnesium, while vitamins include A, B, E, and K. Some studies show that eating them regularly can help reduce the risk of kidney stones, and natural anti-inflammatories may help ease the pain of arthritis. Pumpkin seeds are also full of antioxidants that help protect overall health. When you start reading about the multi-faceted benefits that come with all of our natural ingredients, is it any wonder that our formulas are so effective? Including just pumpkin seed oil in our Anti-Aging Facial Oil, for example, provides all these benefits—and that’s just from one ingredient! Do you enjoy pumpkin seeds as a snack? Do you have other tips for how to use them? Please share with us!